halloween costume diy // queen of hearts | THECLARISSAB ETC. Hey friends! I thought I would share with you all what I did for my Halloween costume this year! I’ll admit, I’m not a huge Halloween person (never did the whole “college halloween” thing) but a friend of mine told me about how The Boston Children’s Museum was going to put on a “Grownups Night” where you dress up, buy drinks, and explore the Children’s Museum. So I said why not! I had a certain costume in mind, that appeared on Lauren Conrad’s blog last year. 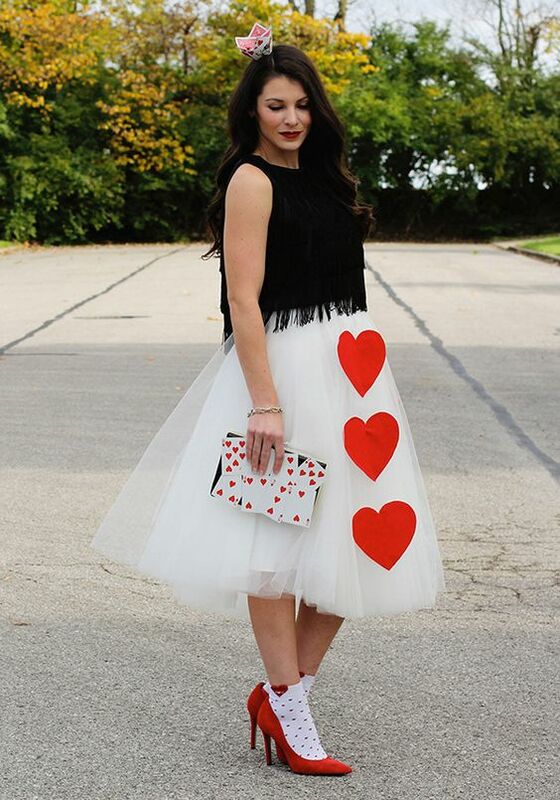 A DIY Queen of Hearts that is classy, cute and SO easy to make. The blogger that was featured is named Haley from Me and Mr. Jones and I’ve linked her tutorial here, to give you step by step instructions in case you need a last minute costume! My take on this adorable costume was a bit more money savvy – since I’m not really into Halloween, I didn’t want to spend a ton of money on my costume. So I thought about what I already owned and went from there! For Haley’s costume, she wore a fringe crop top and a white tulle skirt. I have ALWAYS wanted a tulle skirt. I don’t have many opportunities to wear one, but I thought this was the perfect opportunity to justify buying one 🙂 To be honest, I would never wear a white tulle skirt other than for this costume. HOWEVER, a black tulle skirt would be more versatile (at least in my closet). So I figured, I would buy a black tulle skirt that I can wear more than once instead of a white one. I already have a couple outfits that I’m planning on sharing for the upcoming holidays. Thank you Charlotte Russe! They have a few different styles for tulle skirts (there’s a blush pink one that I REALLY want). 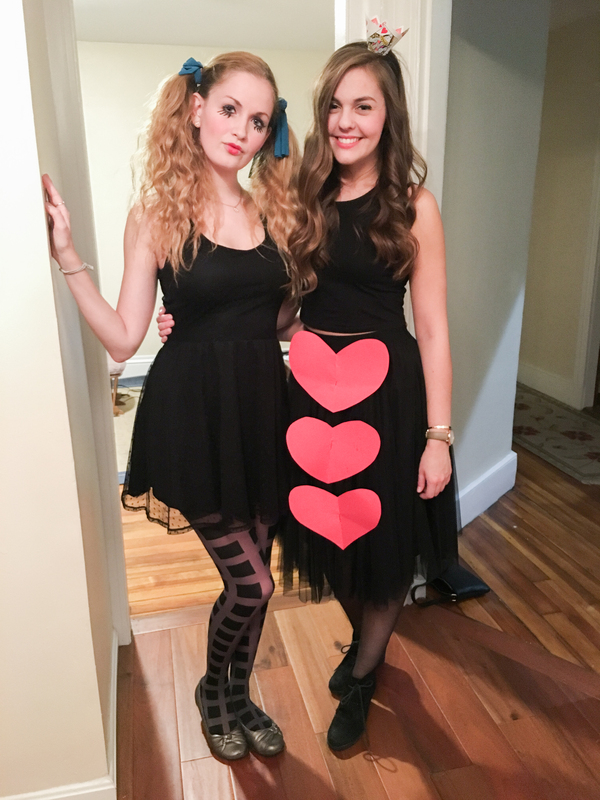 I had some cardstock laying around so I cut three large hearts and safety pinned them to the skirt. For the crown, I bought a red deck of cards ($3). Haley has linked a template for the crown that I used to make mine. I found it super helpful to use Krazy Glue instead of a glue gun to attach the cards. Before folding the cards to form a crown, I stapled them together for an extra hold (Krazy Glue won’t hold when the cards bend). Once I stapled the crown together, I punched two holes on opposite sides and fed a black ribbon through. This makes the crown into a headband. The nice thing is that because of the holes, you can slide the crown to wherever you want it to sit on your head. So there you go – a super easy, cute and cheap costume idea! I ultimately spent $30 on this costume (convinced myself of that tulle skirt!) but you could easily go check out a thrift store and find a cheap skirt.